A child, a younger me, dripping in the rain — no umbrella, no boots, socks and shoes wet — setting leaves into the gutter and chasing them down the street. Joy: unrestrained, unmannered, untethered. In Japan, “omakase” means “I’ll leave it to you,” or more precisely, “I trust you.” It’s a common phrase in fine sushi bars, when you put your meal in the hands of the chef and let him make you whatever he feels inspired to moment by moment. People may complain that it stinks, others that it is sinking, and still more that it is too expensive. Those who are there in the winter lament the floods that render every street and alleyway a canal. But nothing anyone will ever say can sour my love for the most romantic city of them all — Venice. 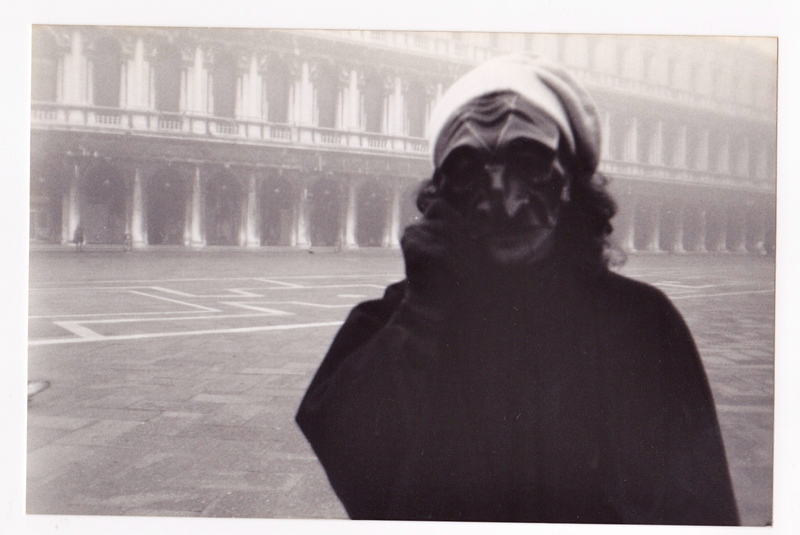 Your host on Piazza San Marco with Venetian carnival mask, a foggy morning in March, circa 199? Sometimes I get a bug for the cuisine of a particular region or city. It’ll happen suddenly, triggered by a conversation or a song or a bit of news I read in the paper. So it was a few days ago when I saw a picture of Venice, one of my favorite cities, in a magazine. With the exception of a one night break for chicken with the in-laws, this evening marks the third straight night of Venetian food at our house. My wife doesn’t care where its from, so long as it tastes good, and my kids get annoying little geography and cultural lessons in the process. And I’m transported to the winding alleys, surprise bridges and ambient gondolier songs of Italy’s sinking treasure. What is the food of Venice like? As, compared for example, with the rest of Italy? Being in a lagoon, there’s a lot of seafood. One of the best seafood markets I ever browsed — aside from the fabled Tsukuji in Tokyo — was one I stumbled onto wandering around Venice. I wished I had a kitchen so I could purchase the strange shellfish and mollusk I saw there… In the bars you can snack on cichetti, the Venetian version of tapas, while you sip one of the regions lovely white Friuli. Risotto is ubiquitous, and the Venetians lay claim to the origins of polenta. Like everywhere else in Italy, they’ve got a famous bean soup. Two of the most fabled dishes associated with Venice are carpaccio and scampi. Indeed, carpaccio was invented here at Harry’s Bar — the beef carpaccio, not the seared ahi tuna kind. Scampi is a particular kind of shellfish related to lobster and also a preparation that in Italy bears little resemblance to the dish that left you reeling with indigestion after that meal at Red Lobster. I’m sharing with you easy and impressive preparations for both. Real scampi is difficult to obtain in the states, so I’ve used large red shrimp. For the carpaccio, you’ll want very high-quality lean beef. Or, if you must, seared ahi. Make the sauce: Put the yolk, vinegar, mustard and a bit of salt and pepper in a bowl and whisk vigorously for a couple minutes, until it becomes foamy with air. Create a mayonnaise emulsion by gradually dripping in half the oil, stirring constantly. Then add the rest in a stream, continuing to stir until it thickens. Then whisk in the lemon juice and Worcestershire, followed by the cream. Sauce should be thick but liquidy. If it is too thick, add a tbsp of milk. If you have a small plastic squirt bottle, put the sauce in there until ready to serve. With your sharpest knife, slice the steak as thinly as you can, and quickly lay the thin slices out on two large plates, as artfully as you can. (You could stretch this to four people, serving as an appetizer on four smaller plates). Once all the steak has been laid out, drizzle with your mayonnaise sauce, creating a pattern on top. Then sprinkle with capers, squeeze a little more lemon over the top, drizzle with a touch more olive oil, sprinkle with flaky salt and pepper and serve. Toast panko in a pan until browned. Transfer to a bowl. Add garlic, parmesan, parsley and basil and toss. Then toss in olive oil. Flatten out the shrimp as demonstrated in the video, with the back of a large knife. Lay down on a baking sheet, split side up (shell down), and place a small mound of panko mixture on top of each shrimp. When finished, bake in a 350 degree oven for about 12 minutes, until panko mixture is turning golden. Remove and serve. (Note: these scampi would also be nice served on top of cappellini tossed with olive oil, lemon juice, freshly minced garlic and grated parmesan, salt and pepper). 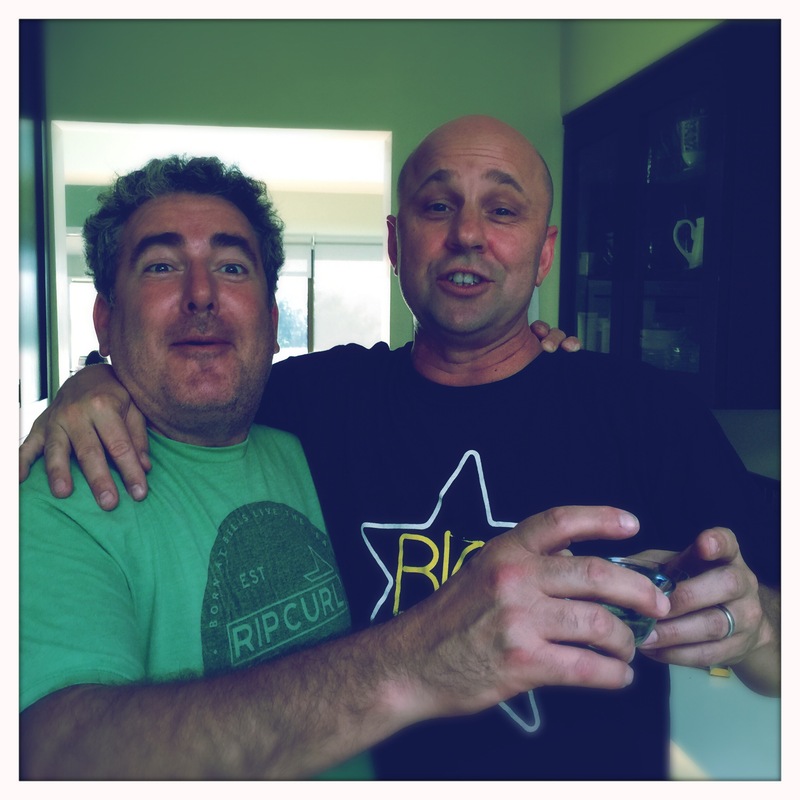 Wine suggestion: a light red or crisp white such as pinot grigio or sauvignon blanc would work well with both dishes.